Hyderabad, August 2016: Hyderabad Runners Society and Bharti Airtel together with the Govt. of Telangana opened the Marathon Expo for the 6th Edition of the Airtel Hyderabad Marathon. The 3-day Marathon Expo is being held along with SportEX India 2016, an exhibition on sports, fitness and wellness products being organized by HITEX Exhibition Center in partnership with Hyderabad Runners. 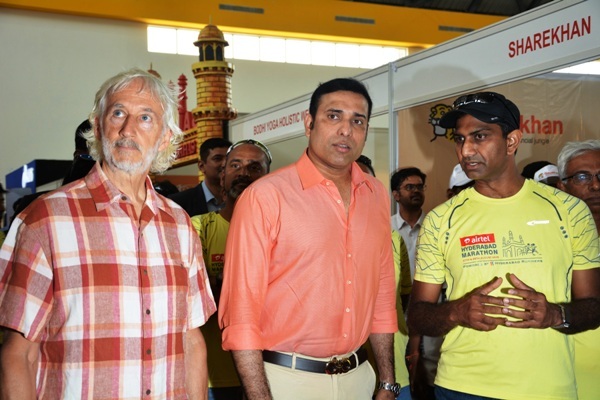 Former Indian cricketer VVS Laxman & Dr. Phil Maffetone, Event Ambassador – Airtel Hyderabad Marathon graced the occasion as the Chief Guest and inaugurated the Marathon Expo and SportEX India 2016. All registered runners in the Airtel Hyderabad Marathon 2016 race across 4 categories will collect their BIB and kit bags. Runners registered for Full Marathon, Half Marathon, 10K runs can collect their bibs on August 26 between 12.00 pm to 8pm & between 10 am to 6 pm on August 27; while runners registered for 5K Run need to collect on August 26 only between 12.00 pm to 8 pm. SportEX India 2016 is a premium and exclusive 3-day event on Sports, Fitness and Wellness at HITEX Exhibition Center. The Expo is specifically designed to showcase all of the latest technology, sports equipment, facilities, services and nutrition to help individuals and fitness enthusiasts to enhance their health and lifestyles and there are Over 100 reputed brands; products and services on display with interactive sessions and Sports Arena. The Government of Telangana is actively supporting the annual sporting event organized by the Hyderabad Runners Society, which is celebrating its 10th year. The 2016 edition of this annual sporting extravaganza will be held on 27th & 28th August with active participation expected to be 16,000 runners. The Airtel Hyderabad Marathon has encouraged participation by the State Police, Paramilitary Police & the Armed Forces in the event. The curtain raiser – 5K Run is on Saturday August 27th and on Marathon Sunday - August 28th 2016, the 10K, Half Marathon (21.095 km) & Full Marathon (42.195 km) will take place. The marathon route will traverse the important landmarks in the city giving the runners a picturesque view of the Hussain Sagar Lake, IT & Knowledge hub of HiTec City & Gachibowli while spreading the healthy lifestyle theme among Hyderabad denizens.